Many of us find ourselves brainstorming resolutions for the New Year. While the top three resolutions in the US tend to be: lose weight, get organized, and save money, we propose doing something different for a change. In 2017, we challenge you to resolve for success this New Year. Here are a few tips to get you started. The Internet is constantly changing and evolving, and the benefit to keeping up with modern web trends come two-fold: it builds your credibility, showing customers that you’re active and invested within your business, and even has the ability to give you a bump in search rankings. Some design experts say big and bold text is the way of the future – take a risk and add try a new eye-catching font pairing on your website today! Be sure to check your analytics so you can gauge your success! What do Bill Gates, Elon Musk, and Mark Zuckerberg all have in common? Beyond being successful entrepreneurs, they each habitually read at least two books a month for education rather than entertainment. In 2017, challenge yourself to become an expert within your industry. Designate time (even 10 minutes!) each day to learn something new. Add an Online Store to your website and start gaining revenue from your website. Don’t sell physical products? No problem – eCommerce is not limited to the tangible! You can easily add digital downloads right to your store front. In addition to helping those in need, studies show that there are proven health benefits associated with giving. These health benefits include: lower blood pressure, increased self-esteem, lower stress levels, longer life, and greater happiness. We know that in being a business owner, time to volunteer and budget to give back may be limited. Therefore this New Year, try hosting a fundraiser and giving back a certain percentage of your revenue. This way you can gain exposure while giving back to your community. Resolve to make your next year even greater than your last. Set business goals to raise web traffic, increase sales, and gain exposure. Track your progress monthly, quarterly, and annually, planning your weeks and holding yourself accountable each step of the way. And be sure to give yourself a pat on the back when you accomplish them. 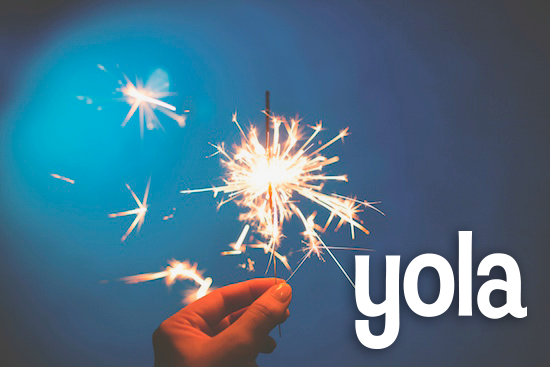 Happy holidays and Happy New Year from the Yola Team. Cheers to 2017!